This significantly expanded edition includes the latest coverage of proper lighting, building design—both the interior and exterior—physical security barriers, the usage of fencing, bollards, natural surveillance, landscaping, and landscape design. Such design concepts and security elements can be applied to address a wide variety of threats including crime prevention, blast mitigation, and CBRNE threat protection. Problem Solving (Finally! ): Mitigation Options: Or Be Careful What You Ask for, You May Get It! Be Clear What You Ask for! Codes and Standards of Care for Infrastructure Protection: Or, Complaining Is Pretending You Have a Choice! President, Atlas Safety & Security Design Inc.
Randall I. Atlas, PhD, AIA, CPP, is president of Atlas Safety & Security Design, Inc., in Fort Lauderdale, Florida. 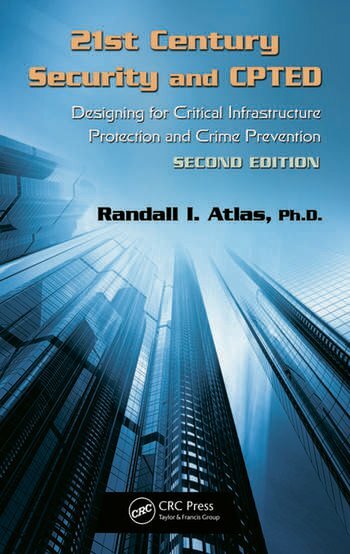 Dr. Atlas is a nationally recognized speaker, trainer, and writer on crime prevention through environmental design (CPTED) and has worked in these capacities for the National Crime Prevention Institute (NCPI), the American Institute of Architects (AIA), and the American Society of Industrial Security (ASIS). Dr. Atlas is a certified protection professional (CPP) with ASIS and is a member and past chairman of the Security Architecture and Engineering Council (SAEC). He is a human factors and ergonomics expert and is a member of the Human Factors and Ergonomics Society and the Environmental Design Research Association (EDRA). He was a technical assistance consultant to the U.S. Department of Housing and Urban Development (HUD) Drug Elimination Grant Program and has conducted numerous CPTED and infrastructure security audits throughout the United States. Dr. Atlas has contributed numerous articles to the Protection of Assets manual and Access Control & Security Systems, Security Technology & Design, Security Management, Door Hardware Institute, and Parking Today magazines. Dr. Atlas serves on the National Fire Protection Association 730 Committee on Premises Security, has contributed to NFPA 730: Guide for Premises Security (NFPA, 2006–2012, Quincy, MA), and has served on the ASIS Physical Security Guidelines Committee, developing the Facility Physical Security Measures (2009) publication. Dr. Atlas serves on the American Society of Testing Materials (ASTM) technical committees F33 on Corrections and Detention Facilities, ASTM E54 Homeland Security Committee, F13 Pedestrian/Walkway Safety and Footwear, and F12 Committee on Security Systems and Equipment. He is a member of the International Society of Crime Prevention Practitioners; the International Association of Counterterrorism and Security Professionals; National Floor Safety Institute Standards Committee B101 Safety Requirements for Slip, Trip and Fall Prevention; Florida Design Out Crime; and United States Regional Board representative of the International CPTED Association. Dr. Atlas is certified in the Sandia Labs Risk Assessment Methodology RAM-W (Dams), RAM-T (Power) 2002; critical infrastructure and asset protection—ACAM and PCII, April 2010; antiterrorism specialist, Anti-Terrorism Accreditation Board, 2010; and is a certified master antiterrorism specialist, Anti-Terrorism Accreditation Board, 2010. Dr. Atlas serves as an expert witness on many premises security cases and as an architectural consultant on large justice architecture projects. He received his doctorate in criminology from Florida State University, a master’s of architecture from the University of Illinois, and has bachelor degrees in architecture and criminal justice from the University of Florida and the University of South Florida, respectively. A major guide to CPTED takes up the cause of Crime Prevention Through Environmental Design. … Each chapter has plenty of references and web links. … Arguably most important is one of the end chapters, on measuring success. … As it’s a hefty book, if well-aimed, it could knock some sense into the heads of builders and contractors.